Isn’t annoying? Let’s disable these popups altogether. Create a new key. Right click on Advanced and click New and select DWORD (32-bit) Value. Click Registry Editor. Log off and log back in. That’s it, no more popups. Enjoy. 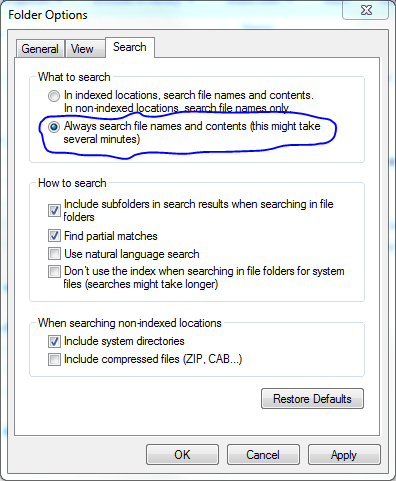 Windows 7: How to search file contents? You would think what kind of stupid question is that? But If I ask you how to search file contents in Windows 7, it will take some time figure out. It was very easy in Windows XP (just use classic search tool). Windows Explorer has a search box, but by default it only search file names, file content and meta data ONLY in INDEXED LOCATIONS. Here is how you enable content searching. 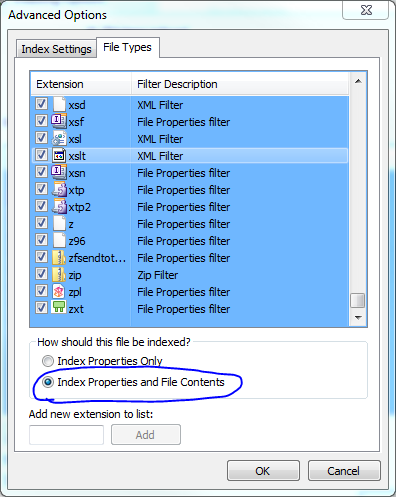 You HAVE to enable a setting to index the file contents, so you can search it later. Here is how you enable the context indexing. Unfortunately you have select the needed file types one at time a time and repeat steps 5 and 6.